We've been posting photos and reports of all of the people that have stopped into our stores in the middle of their bicycle touring trips lately. The season is winding down, and we're seeing a little less touring traffic now, but we can finally report on a local group that, instead of passing through, have started here in NE Ohio and are heading across the country on their bikes. 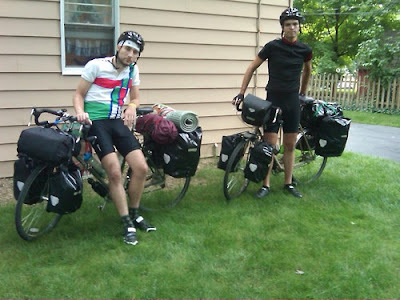 Karl and Todd, who describe themselves as "two stupid vegan pussies packing everything on bicycles for a self-sustained journey from Akron, Ohio to San Francisco," left from Cuyahoga Falls this past Satuday, August 8. They are riding a pair of Surly Long Haul Trucker bicycles that they bought from the Century Cycles store in Peninsula.